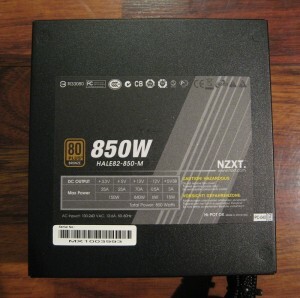 NZXT has sent us a brand new just-released power supply known as the HALE82 850w. 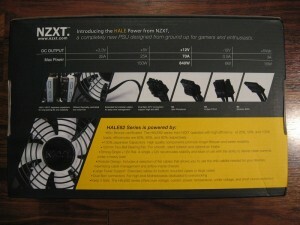 If the HALE branding sounds familiar you’re probably thinking of NZXT’s HALE90 series of PSUs. The only downside to the HALE90 units is that 80+ Gold parts and designs are expensive! The HALE82 series is 80+ Bronze rated and should cost significantly less than the HALE90 units, while maintaining the excellent NZXT quality. 80+ Bronze Certification – The HALE82 series from NZXT operates with high efficiency: at 20%, 50%, and 100% loads, efficiencies are 82%, 85%, and 82% respectively. 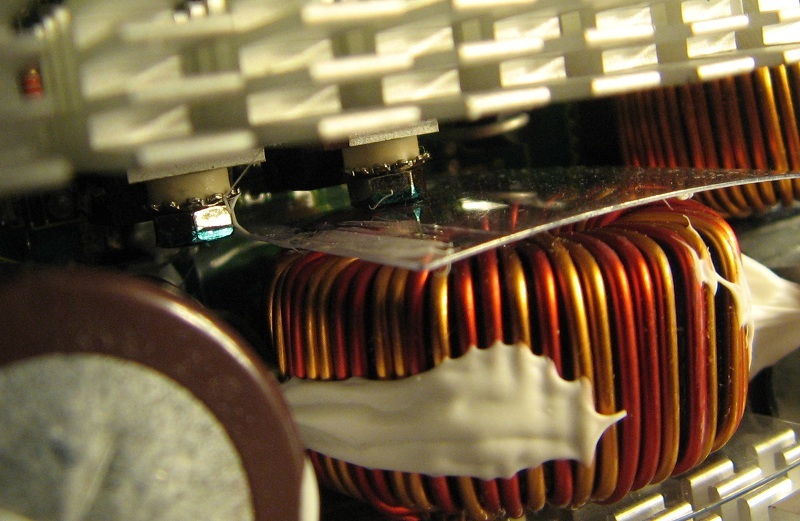 • 100% Japanese Capacitors – High quality components promote longer lifespan and better reliability. • 120mm Two-Ball Bearing Fan – For smooth, silent rotation and optimal air intake. • Strong Single +12V Rail – A single +12V rail provides stability and ease of use with the ability to deliver clean currents under a heavy load. • Modular Design – Includes a selection of flat cables that allow the user to pick and choose which cables they want to use, maximizing cable management and airflow inside chassis. • Large Tower Support – Extended 8pin connector for bottom mounted cases or large cases. 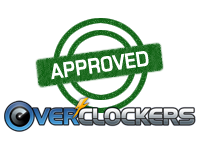 • Dual 8pin connector – For high end motherbaords dedicated to overclocking. • Keeping it Safe – The HALE80 series offers over voltage, current, power, temperature, under voltage, and short circuit protection. All good features. The flat ribbon style modular cables don’t look as nice as the sleeved cables, but they are very easy to route through narrow places for cable management. 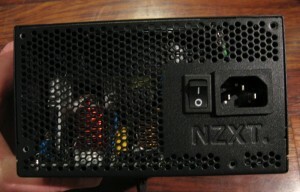 The 8-pin connector is indeed quite long, definitely a plus for full tower cases! The single 12v rail means that it takes a lot to hit OCP (Over Current Protection), but you won’t have to worry about which rail you’re plugging your GPUs into either. 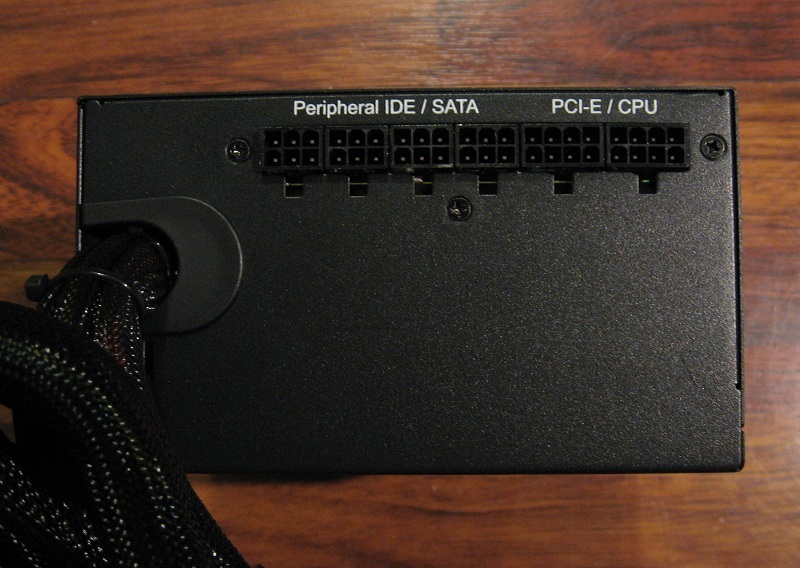 Many PSU manufacturers put out single rail designs and them claim they have multiple rails, so it is refreshing to see the single rail nature of this PSU right out in the open. What isn’t mentioned is that this is a DC-DC regulation design for the 5v and 3.3v rails, I’m rather surprised they don’t list it as a feature. Now that we have the features taken care of, let’s look at the specs. Here we see the DC-DC regulation of the minor rails, any time a unit can put out its entire wattage rating (or very close) on the 12v rail odds are good that it is DC-DC. We’ll talk about what DC-DC regulation is in a bit. Lots of cables, and nice long cables at that. No FDD power plug though, nor is there an adapter in the box. FDD power plugs aren’t used for much these days, but if you need one you’ll have to buy a Molex-FDD adapter plug. The box is a nice simple affair, no massive gaudy labels or walls of advertising text, it lists the primary features in a variety of languages. Now let’s open it up and see what is inside, I suspect there is a PSU in there personally. Look at that, I found a PSU. 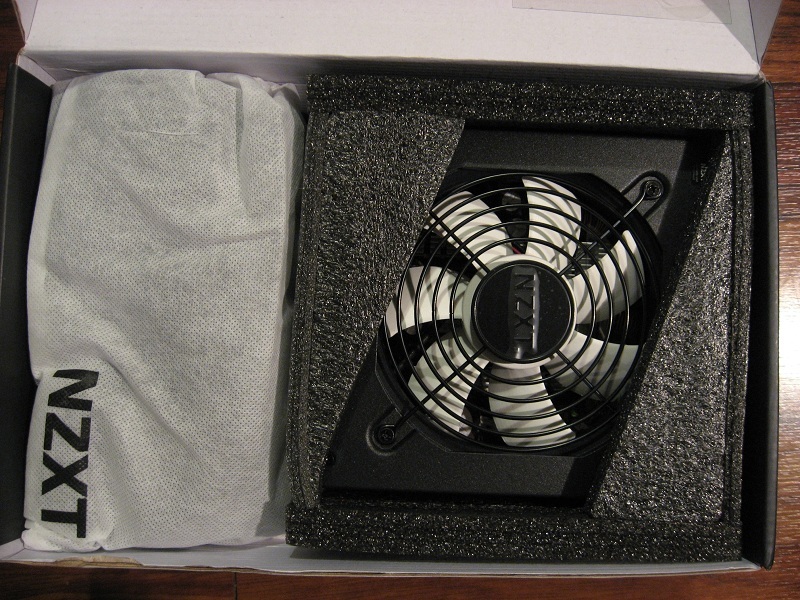 This is a very well packed PSU, the foam shell has two halves and covers all sides and corners of the PSU. 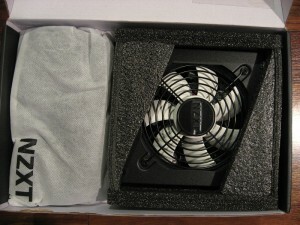 I don’t think I’ve seen a PSU packed this well before. On the left is a sack with all the modular cables in it. 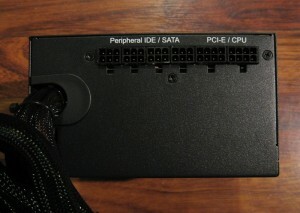 I’ll spread them all out in a bit here, but first lets look at the PSU itself. HALE82 850w PSU, fan side. 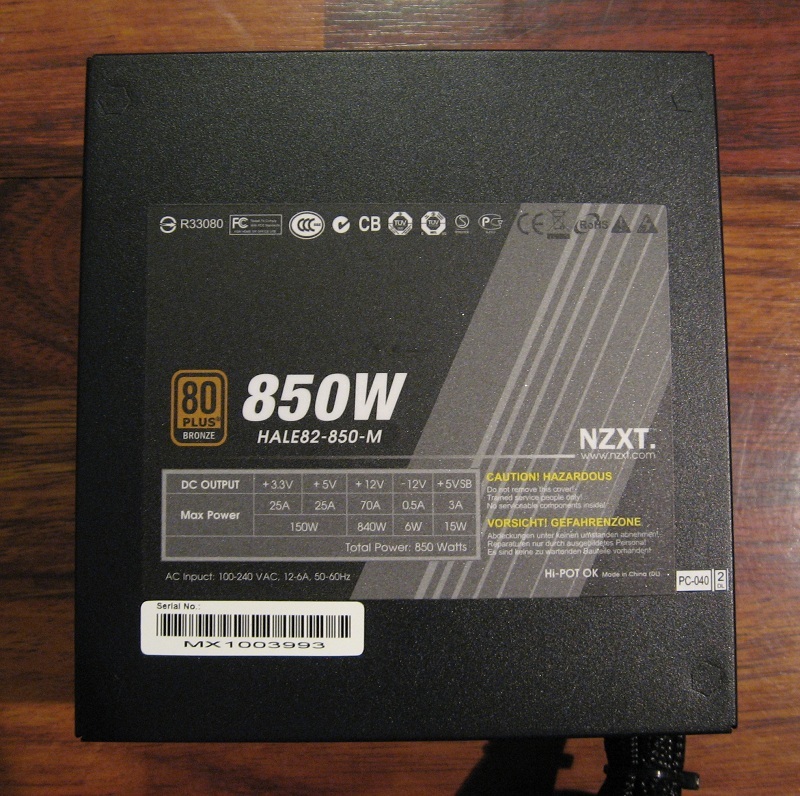 HALE82 850w PSU, label side. HALE82 850w PSU, grill side. HALE82 850w PSU, output side. HALE82 850w with its cables. I like this PSU even more now, it has nice subtle styling, lots of cables and it comes with a nice juicy wall cord as well. 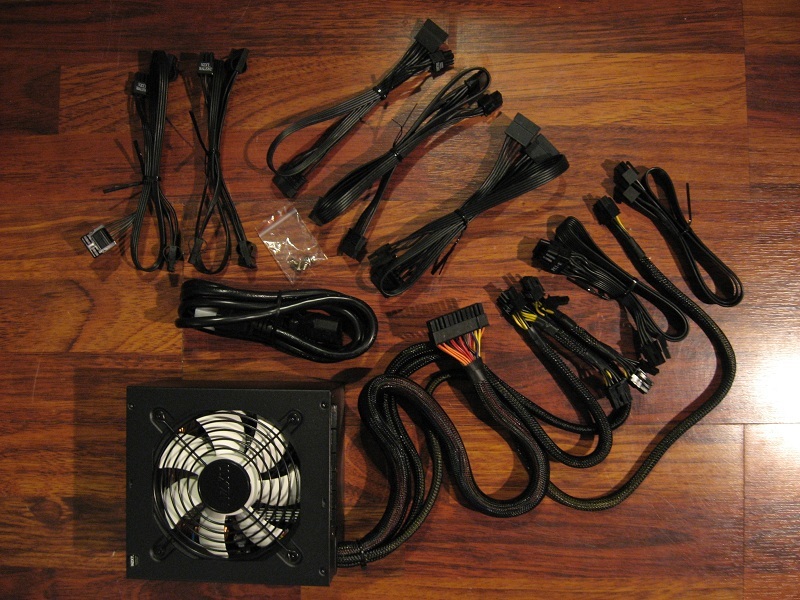 I would prefer that only one PCIe cable was hard wired, though if you’re only using one cable you probably didn’t need to buy a 850 W PSU in the first place. It would also be nice if there was a Molex-FDD adapter included. Now that we’ve looked at the box and the PSU, let’s test it! The PSU, not the box. 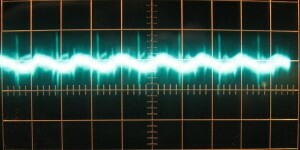 First, a bit about testing power supplies. 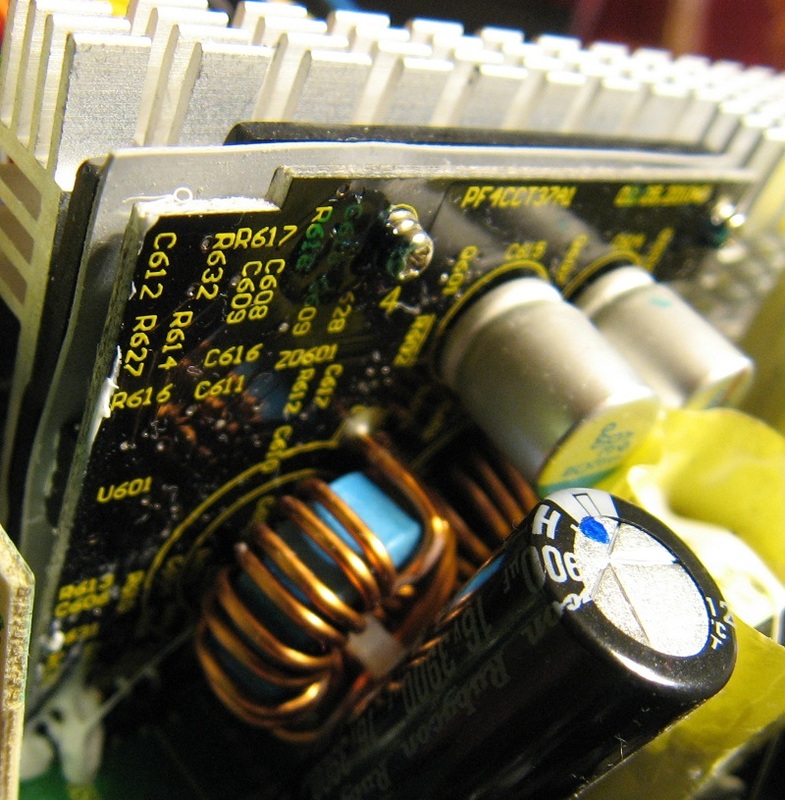 Unlike most computer parts, power supplies require rather specialized equipment to test correctly. Sure, you can plug it into a computer system and see if it can run a 980x and a couple GTX580s, but that doesn’t tell you how much power the PSU is putting out, nor what that voltage looks like. Worse, if the unit is defective or simply underbuilt/overrated the unit can fail catastrophically and take your computer along with it! Hence, you really need a load that is strong enough to stand up to a PSU dying while attached to it! Purpose built loads and the testing units to run them cost thousands of dollars. They’re easy to use and very accurate and definitely the ideal way to test power supplies, but also entirely too expensive for me to afford. Instead I have built my own! It’s entirely mechanical and not automated in the slightest, but it can put a serious load on a PSU and survive the PSU failing in the process. The down side is that it doesn’t have the built-in current sensing that a professional grade unit does, so PSU efficiency is difficult to nail down. 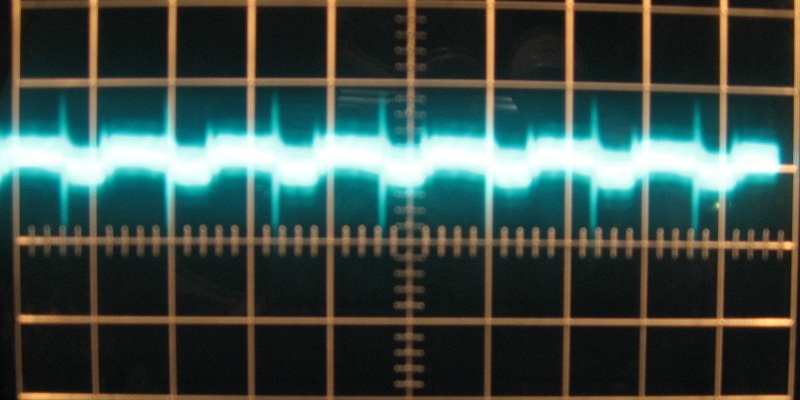 The second part to a good PSU review is an oscilloscope to look at the outputs and check for ripple (I’ll talk about what ripple is in the ripple section), for this purpose I have a BK Precision model 1472B analog scope. It has its pluses and minuses compared to more modern USB scopes. On the minus side, taking pictures of it is a difficult operation at best as you’ll see. 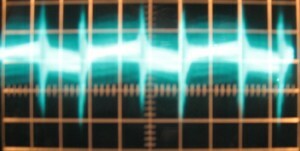 On the plus side, it has incredible sensitivity at high frequencies, something that many USB scopes lack. Lastly, a voltage meter is required, I have a nice cheap unit that I have compared against a highly expensive Fluke 88 and found to match to within 10 mV. That’s good enough for me! On the procedure end of things, I first check the voltages and ripple with no load on the PSU at all. This is a quite unrealistic test and many PSUs do not appreciate it at all, but I like to test it anyway. If the zero load results are terrible I put a small load on the PSU to simulate idle conditions with a low power computer and test the ripple again. Some PSUs are specifically rated for zero load operation, though this is not one of them. With that out of the way, I put successively higher loads on the PSU and check the voltages of the three main rails, all the way up to the PSU’s maximum output. 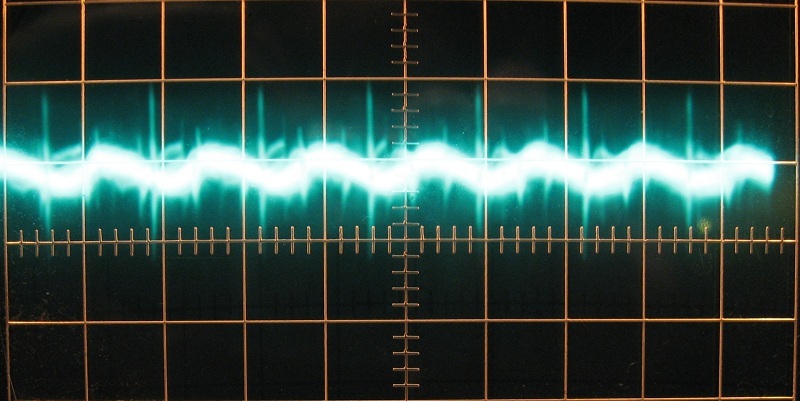 At the maximum output comes the last test, ripple at 95-100% load. 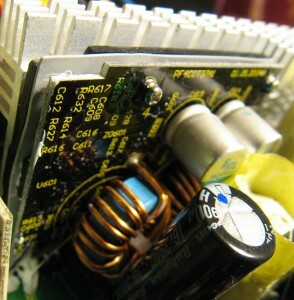 This does assume that the PSU didn’t explode on the way to full load of course! I’d be quite surprised if the HALE82 850 W unit did, but it happens on lower end units sometimes. 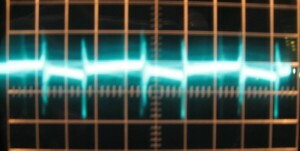 The 12 V, 5 V and 3.3 V rails need to stay within 5% of their official value to stay within spec, closer is ideal of course. 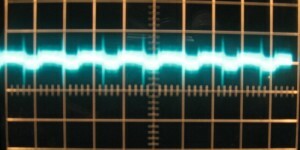 That means 12 V needs to be between 11.40-12.60 V, 5 V needs to be between 4.75-5.25 V and 3.3 V needs to be between 3.135-3.465 V.
Without further ado, we have the load tests ranging from 0 W through ~846 W of load. Mighty good regulation here, the entire range of voltage movement on the 12 V rail was 50 mV, that is tiny! Well done, NZXT. At full load the fan speed up significantly and gets fairly noisy, it’s almost entirely airflow noise and hence not obnoxious. Given that almost anything that can eat 850 W will be rather noisy itself I don’t see it being an issue. At lower load levels the fan is very quiet. 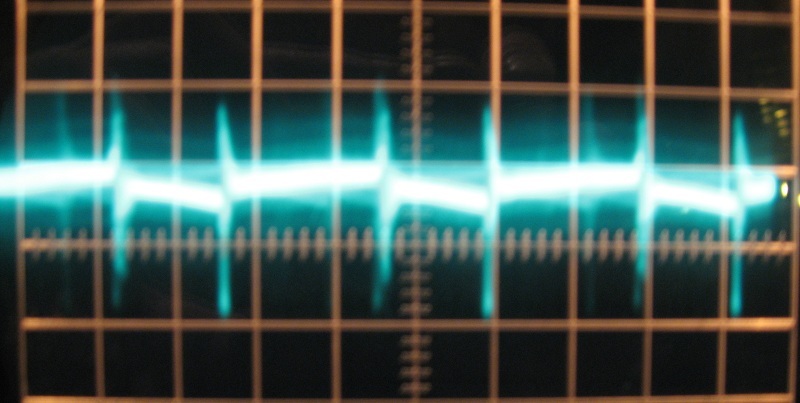 Ripple is a measurement of how far above and below the median voltage the voltage goes. 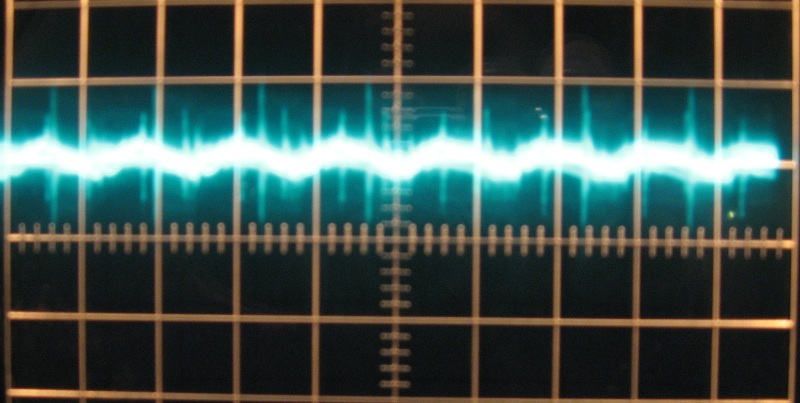 To put it more simply, ripple is how much the voltage bounces around. 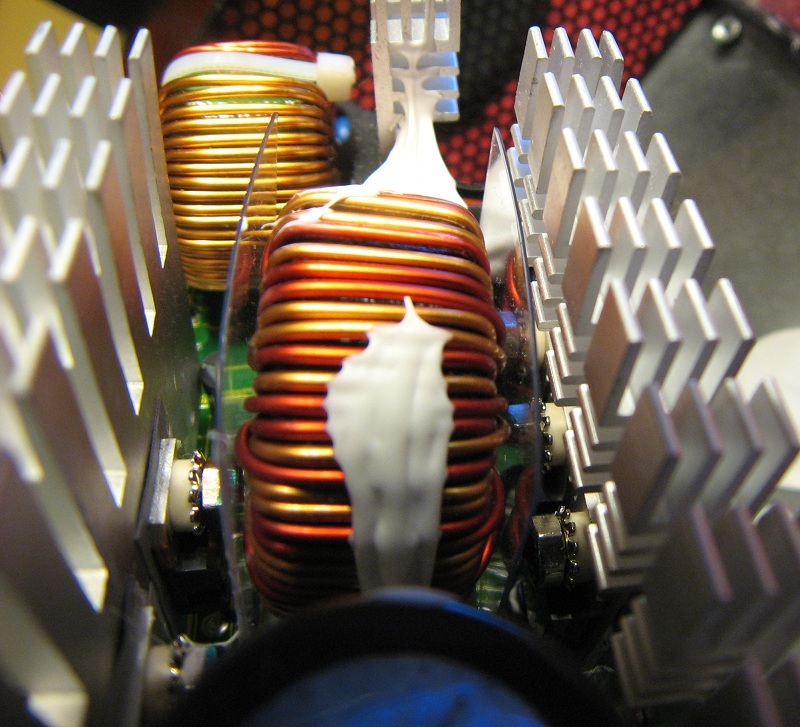 All power supplies have some ripple due to their design, it is impossible to get rid of all of it, and very expensive to try. 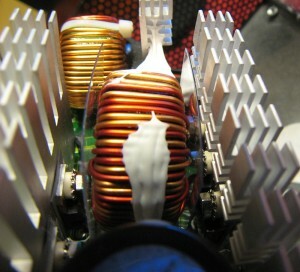 The more ripple in the voltage outputs the harder time components have making use of it, this is why almost every computer part out there has capacitors on it’s voltage inputs to smooth the ripple out. 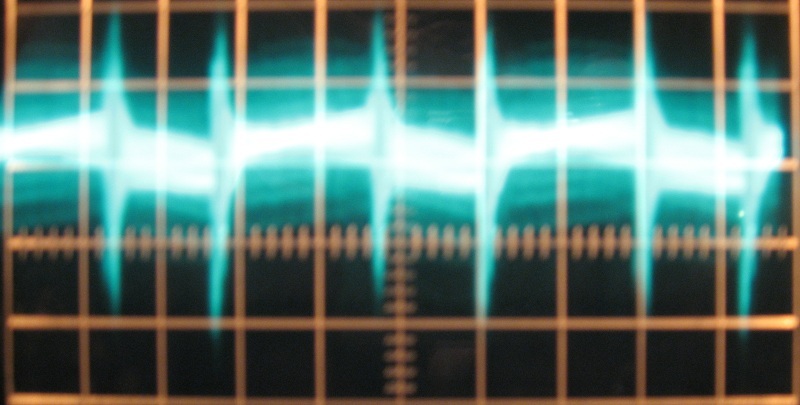 In the hunt for the worst of the ripple I check everywhere from 10 milliseconds per divider down to 0.5 microseconds per divider, and record the worst that I find. For all of the full load tests I have loaded the entire unit down to its full rated maximum, not just the rail I am checking. The ATX specifications have a ripple spec as well of course, for the 12 V rail it is 120 mV, while for 5 v and 3.3 V it is 50 mV. We’ll go through 12 V, then 5 V, then 3.3 V. Unfortunately, my camera decided not to focus after I took the first picture. I guess it’s about time for a new camera. The 3.3 and 5 volt as well as the 12 volt zero load shots are all with 2 or 5 microseconds per divider left to right, while the 12 volt load shot is five milliseconds. In all the shots there are 10 mV per divider vertically. 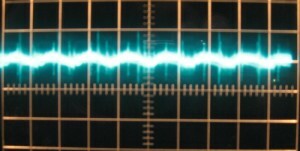 The 12 volt rail’s results are excellent, far below the maximum allowed ripple. The 5 volt and 3.3 volt rails are closer to the maximum allowed, but still well below it. 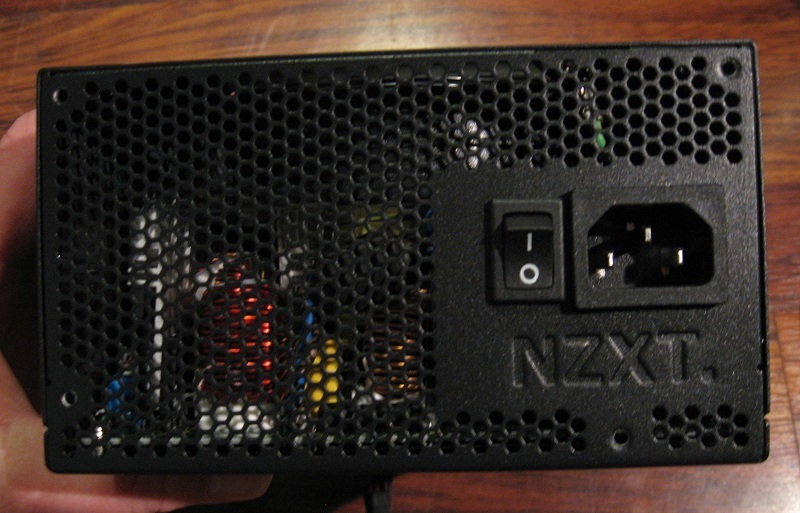 Overall, this NZXT HALE82 850 W PSU does quite well through the ripple section, just like it did in the voltage testing section prior to this. 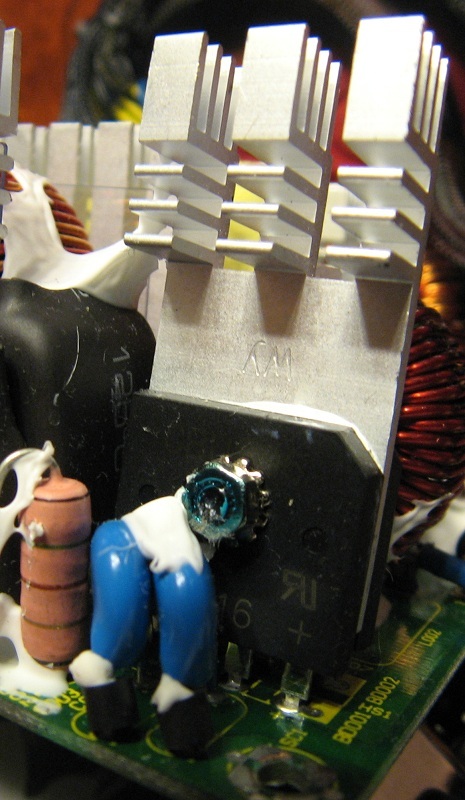 Disclaimer: Power supplies have dangerous voltages inside them, DO NOT OPEN POWER SUPPLIES. It’s just not a good idea, and could very well kill you. Don’t try this at home. Don’t try this at work. Just don’t do it. With that out of the way, I’ll crack this thing open and we’ll see what is inside it. I think this is my favorite part of power supply reviews, really. 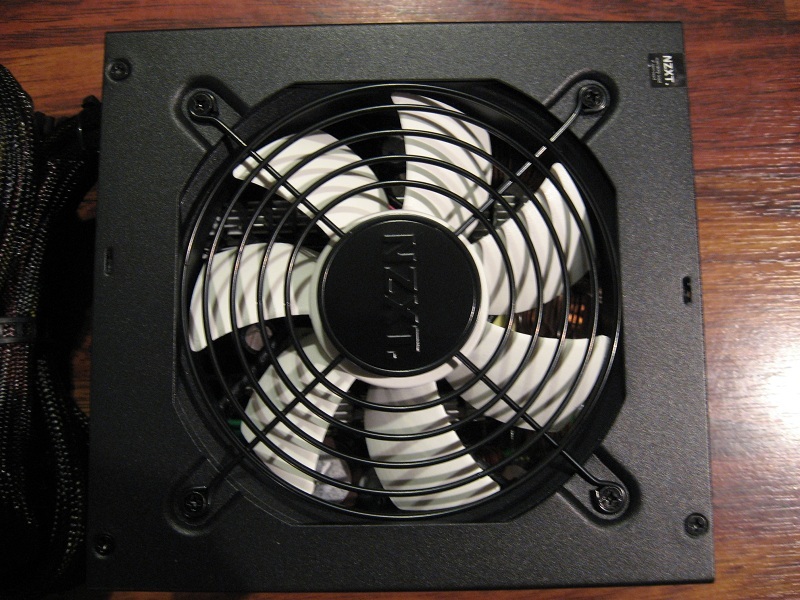 First let’s look at the fan, it’s a 120 mm rated at half an amp at full blast. An interesting touch is that the fan blades are white, rather than the standard black. I like it. 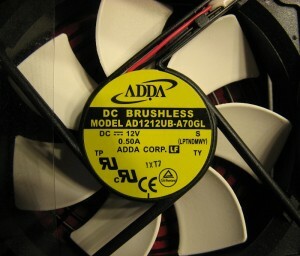 ADDA is a very well known fan manufacturer, their fans are in quite a few PSUs out there. This whole operation starts with the wall cord plug on the back of the unit, attached to said plug is a PCB. 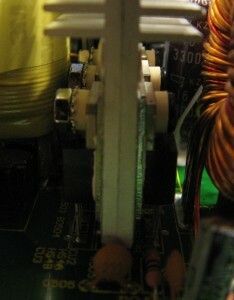 That PCB has an X capacitor, two Y capacitors, and an inductor, this forms the beginning of the input transient filter. Also attached is the on/off switch for the unit. An interesting touch is a copper shield on the back of the PCB to reduce the electrical interference put out by the filter. After the first half of the transient filter the electrons head off to the main PCB, where they go through the rest of the transient filter. On the main PCB is another X capacitor, two more Y capacitors, and a pair of inductors. Following that is a fuse and what is either a TVS diode or a MOV for surge protection. I think it’s a TVS diode, but I’m not positive. 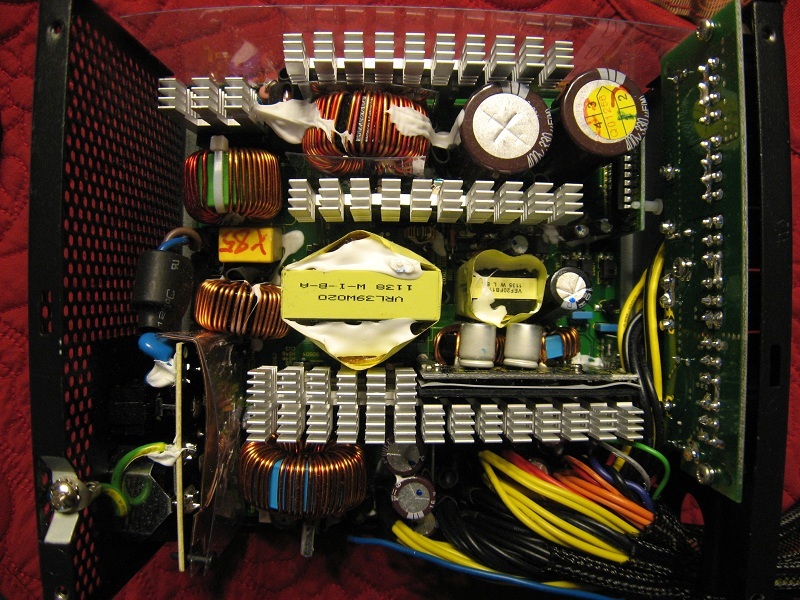 Following that is the main rectifier, which is actually a pair of GBU806 rectifiers rated at 8 amps and 600 V each. 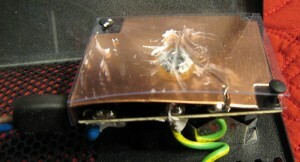 Receptacle transient filter EMF shield. Once through that, the electrons head to the aPFC, at this stage the voltage is increased from the ~120 V that comes in from the wall up to somewhere in the mid 300 V range, and then stored in two large capacitors. 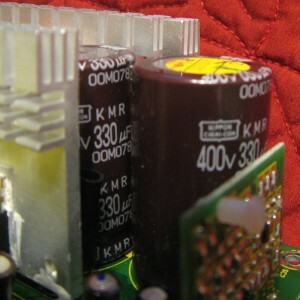 The main capacitors are Nippon Chemi-con parts. The aPFC switches are three 18N50 mosfets rated at 18 amps and 500 V each, then there is a diode that I was unable to identify. aPFC mosfets(right) and primary switching mosfets. 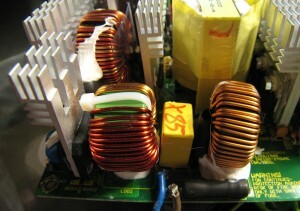 After being stored in the main capacitor the electrons head to the main switches, a pair of 24N60C3 mosfets, rated at 24 amps and 600 volts each, and then through the main transformer. Next are the 12 rectifiers, which are a bit of an odd situation. There are six 30A60CT schottkys, but only two actually have their output leg soldered to the PCB. 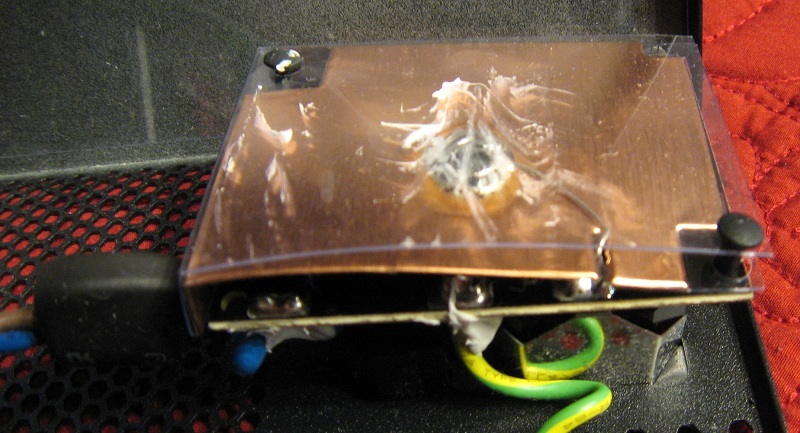 The result is that there are effectively only two 30A60CT rectifiers, rated at 30 amps and 600 volts each. 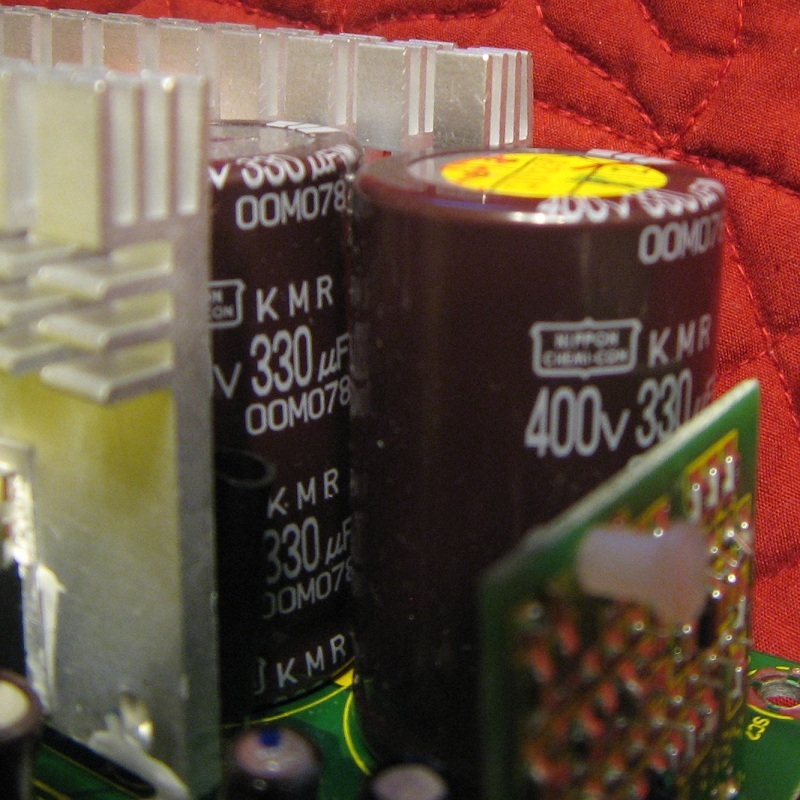 The output capacitors are more Nippon Chemi-Con units. Center output pin not soldered, strange. On the back of the modular output PCB are four more filter capacitors as well, this is a nice touch. Modular output board and filter caps. The 5 V and 3.3 V rails are done by a daughter board with a pair of DC-DC regulators on it. 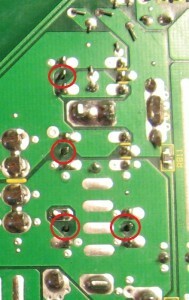 The mosfets for said board are covered by an aluminum heatspreader and are not identifiable. In case you’re still curious as to what DC-DC regulation is, I’ll explain. 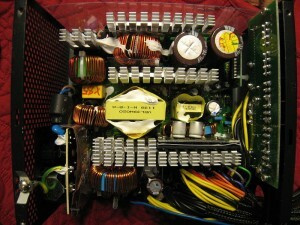 A “normal” power supply has three separate primary regulators, one for 12 volts, one for 5 volts and one for 3.3 volts. This works fine, but a big primary regulation module has terrible efficiency at low loads and 3.3 volts especially is not used by much these days. Hence the 3.3 volt regulator is mostly idle and burns up power, as does the 5 volt to a lesser level. In a DC-DC regulated unit there is only one primary regulator, 12 volts. The entire unit capacity is first regulated to 12 volts, and then there are “buck” controllers to drop the 12 volts down to 5 volts and 3.3 volts. Buck regulators retain their efficiency at low loads much better than the big primary regulators and hence don’t waste as much power. 80+ Bronze is attainable via normal methods, but it is much easier to attain via DC-DC regulation. Higher efficiency units rated at 80+ Gold are almost certainly DC-DC, as attaining 80+ Gold without going to DC-DC is nearly impossible. The only downside to DC-DC regulation is that is uses more parts and more PCB space, hence the daughter board for the 5 volt and 3.3 volt regulators. 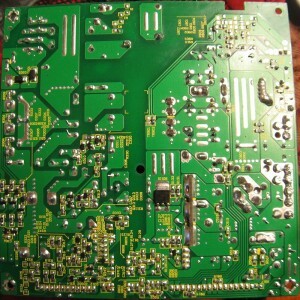 More PCBs and more parts means a higher bill of materials and likely a higher price, it’s the price you pay for efficiency. 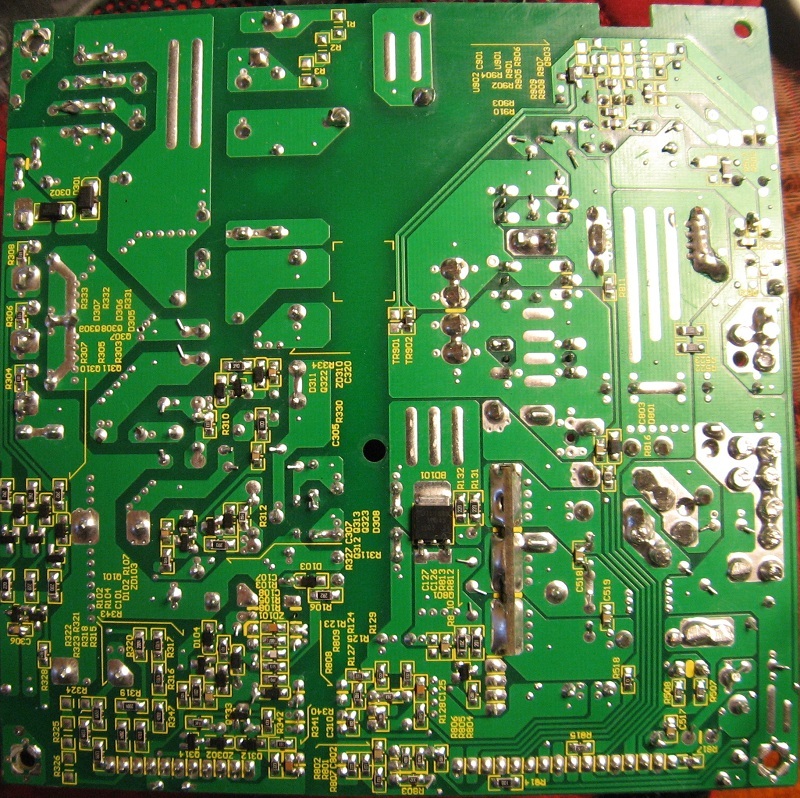 Overall the soldering is quite good, there are a few places with more solder than needed, and a couple through-hole components that could do with a little bit more. Overall it is definitely a good soldering job, nothing here is going to cause an issue at all. 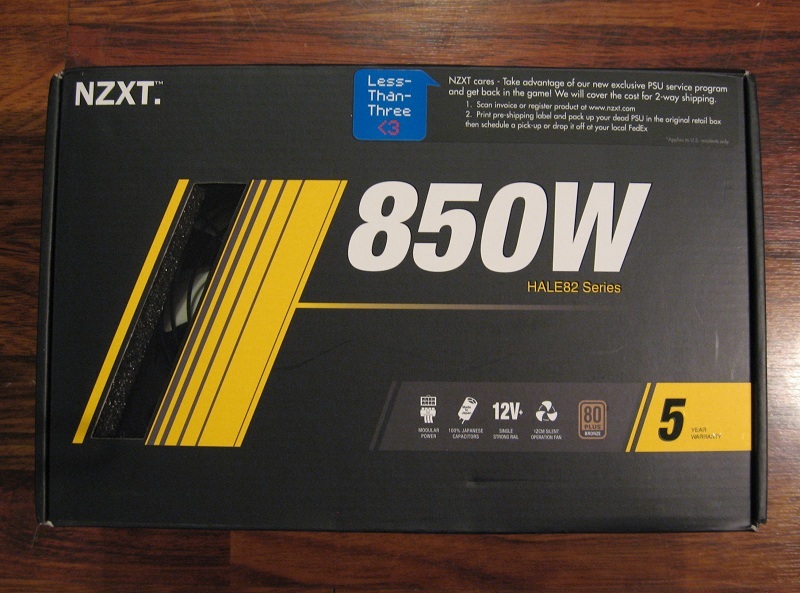 The quality-but-not-horribly-expensive PSU market is a tough one. High-end designs are expensive and require high price tags, while cheap designs are just that, cheap. NZXT has stuck to the middle ground and used quality components and a quality design, while avoiding the tendency to go overboard aiming for high efficiency and being stuck with a high price. The result is that this HALE82 850 W unit isn’t as efficient as its HALE90 older brother, but it still holds its own when it comes to regulation and ripple. When you get down to it the HALE82 beats many 80+ Silver units in those tests! Being rated at 80+ Bronze means that it isn’t exactly a low efficiency PSU either, until fairly recently 80+ Bronze was as good as it got. The build quality is excellent, all the capacitors really are Japanese, the cables are well-sleeved and the sleeving goes all the way into the unit. The MSRP for this unit is $139, which is probably about right. You can spend a bit less money and get 80+ silver at the cost of the modular cables, or you can get the modular cables and stay Bronze and pay a bit less for a unit that doesn’t come from one of the major high quality manufacturers. What you cannot do is get a unit from a major brand with known-good quality (a group that NZXT has joined with the HALE series of PSUs) with these features for less money. I call that a good value. Excellent voltage regulation all the way up to its maximum rating. 12 volt rail ripple is excellent, 5 volt and 3.3 volt ripple is also well controlled. Fan very quiet at mid range loads and lower. Excellent looks, well sleeved cables and a white fan to add some accent. All the claims on the box are true. Price is right on for the quality, features, and efficiency. Modular cables are ribbon cables, making for easy cable management. Hard wired cables are nice and long, making for easy cable management. Fan fairly noisy at 100% load. No FDD power plug or adapter. That’s a pretty short list there! 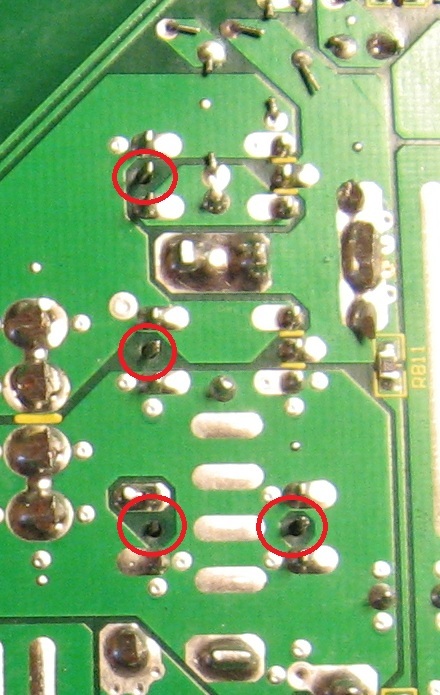 I’m not listing the unsoldered output pins in the cons section because they’re very specifically designed that way. It makes very little sense to me, but the unit seems perfectly happy this way, so I can’t complain. The bottom line is that this is a very good unit, and I won’t hesitate to give it an approved stamp! The pictures you took of the scope display are much easier to read in this review than the antec one you just did. Thanks for all the hard work doing these reviews. Glad you like the review! Looks like a nice PSU for sure! Nice review, quite thorough and what I wanted to know about a PSU! Just curious, does the "82" and "90" in HALE82/HALE90 have any reflection of the efficiency or 80+ rating of the unit? Sounds like it might. I believe so, 80+ bronze says minimum 82% efficiency at 20% and 80% load levels. 80+ Gold may well mean 90% minimum. It's so nice to have a proper PSU reviewer. Thanks for all your hard work Bobnova, excellent review! Very nice review Bob! Word! Love my NZXT Hale90 850W! So damn glad I popped for it!